We offer 2 kinds of ways to make your payment. How do I purchase my order(s)? After I have made my purchase, when will I receive my order? There is no payment button on some product pages. Why? I can't find the product I want. What should I do? Can I get a full refund if I have failed my exam? What are the details of FirstTryCertify Q&Ss? Can I pass the exam only with FirstTryCertify Practice Exams? Do I get FREE Updates after I have made my purchase? How often do you update your product(s)? Do you offer FREE Demos to view? What format are FirstTryCertify products in? How is the security of my account information on your website? Could I get an invoice of my order or even a custom invoice so my workplace can pay for my training? How long should I take to prepare for my exam using FirstTryCertify Product(s)? How do I send feedback with regards to specific questions? 1. We offer 2 kinds of ways to make your payment. Answer: Paypal - Paypal supports payment thru Visa, MasterCard, American Express, Discover Card, JCB, Debit. You also do not need a Paypal account to make your purchase. You can use your Paypal account or just use your credit card. Paypal accepts both ways of payments. Western Union: If you do not have a credit card, please use Western Union. We will also give you a 5% discount if you choose to use Western Union. 2. How do I purchase my order(s)? Answer: All you have to do is select your order by clicking on add to cart, then select checkout. You will then be directed to a secure Paypal page where you will be able to place your order. You have to be logged in to place your order. If you are not a member, you can signup to become a member FREE. If you buy more than one product, you can simply continue to shop. You can see your shopping cart by clicking on the shopping cart icon on the top right corner of the website. This will show you what exams are in your shopping cart. If you are not a member, you will be taken to our registration page. 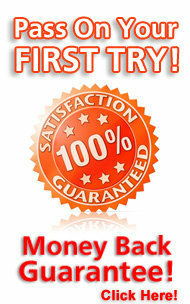 Becoming a member of FirstTryCertify is FREE. 3. After I have made my purchase, when will I receive my order? Answer: Your order is instant after purchase. You will receive your order right after purchase instantly. You do not have to wait like other vendors. Our products are directly downloaded right after your purchase. You will be redirected to your members area right after purchase where you will be able to download your order instantly. 4. There is no payment button on some product pages. Why? Answer: This is because the product is currently being updated. When the update is complete, we will email you when the product is released again. 5. I can't find the product I want. What should I do? Answer: You can use our product search filed by typing in the exact exam number you are interested in. If we for some reason do not offer the exam you are interested in, you can email sales@firsttrycertify.com requesting when the exam will be available. 6. Can I get a full refund if I have failed my exam? Answer: Yes, we provide a full refund if you fail your exam within 120 days after your purchase date. We will spare no effort to find out the true reason for your failure in order to improve the quality of our products. If you fail your exam on Your First Try, we will issue you a FULL REFUND within 5 days after you have submitted your transcript. This is very unlikely since 99% of our customers pass their exams. 7. What are the details of FirstTryCertify Q&Ss? Answer: FirstTryCerify.com Practice Exams include both high-quality Questions and Answers used to prepare candidates to successfully pass your exams On Your First Try! You can download a free demo on our product pages in which you will see what you will receive. 8. Can I pass the exam only with FirstTryCertify Practice Exams? Answer: We Guarantee you can pass your exam on Your First Try! Our products cover 95% of the exam questions you will encounter when writing your exam. 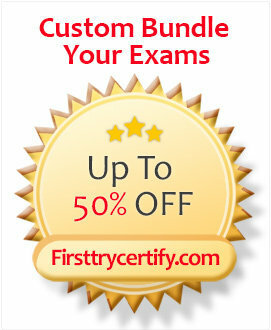 FirstTryCertify Practice Exams are written to the highest standards of technical accuracy. We have expert certified authors that write our exams and you can be rest assured in passing on Your First Try! 9. Do I get FREE Updates after I have made my purchase? Answer: You get FREE updates for 6 months after your purchase date. For discounted bundle purchases, you will receive 1 Year of FREE Updates. When there is an update, all you have to do is login to your members area and download the update. To find if an update has been done, you can visit the product page(s) where you made your purchase, or you will receive an email from FirstTryCertify stating there has been an update to your purchased order. You will then need to login to your members area and click on the download link in which it will automatically update your exam guide. If you product has expired after 6 months, you can re-purchase your order with a 50% discount. 10. How often do you update your product(s)? Answer: Our IT Experts update our products continuously. The certification vendors often change the objectives on their exams. So, if there is any change in any exam(s), we will update our products immediately, and send you a notification email that an update as been done. This way, you will be rest assured you have the latest and up to date practice exam questions. 11. Do you offer FREE Demos to view? Answer: Yes, we offer FREE Demos in which you can view on all our product pages. You can just click on the download link and you will be able to download a pdf file and testing engine. We offer both pdf files and testing engine. Some vendors just offer a pdf file, we offer both a pdf file and a testing engine. Pdf files can be printed in case you like to study by printing the practice exam. 12. What format are FirstTryCertify products in? Answer: FirstTryCertify.com products are in PDF Format and Testing Engine Format. We are one of the only vendors that offer both a pdf file and a testing engine with the purchase of your order. 13. How is the security of my account information on your website? Answer: We can make sure that your account information is absolutely secure on FirstTryCertify. Since payment is made directly on Paypal, you can be rest assured, secure and safe. Paypal is the largest third party credit card processor. Many of the biggest websites like Amazon, E-bay use Paypal as their credit card merchant. We consider our customers confidential information as the most important thing to us. We have no access to your information or store your confidential information on any server. 14. Could I get an invoice of my order or even a custom invoice so my workplace can pay for my training? Answer: Yes, we can make a custom receipt for you. You get a receipt right after payment anyway but if you need a detailed custom receipt, we can make this for you. 15. How long should I take to prepare for my exam using FirstTryCertify Product(s)? Answer: It depends on how long you are studying the practice exam questions. The more time you invest in your studies, the faster you will be prepared and ready to take the exam. 16. How do I send feedback with regards to specific questions? Answer: We love to hear your feedback and reviews on our products. You can contact us here and let us know your feedback on our practice exam questions. 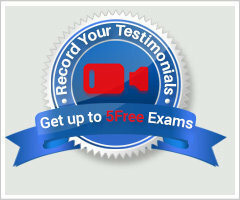 We would love to here your review on how you passed your exam using our material to prepare. If there is a question number you are unsure about, please also contact us and please make sure you include the below information when contacting us about a specific question number(s) on an exam. 17. Does The Testing Engine Software Work on a MAC. Yes IT Does?